This evening we head to our first booy­ah (though our hosts spell it with­out the “h”). Not to be con­fused with sports­cast­er Stu­art Scott’s or mon­ey guy Jim Cramer’s exu­ber­ant catch-phrase, the booy­ah under dis­cus­sion here is a thick meat-and-veg­etable stew boiled out­doors in a huge pot. It is also the name of the event at which such fare is served to the pub­lic. Booy­ah is a Mid­west­ern thing, and more par­tic­u­lar­ly Upper Mid­west­ern. A booy­ah is a long-sim­mer­ing broth-based stew, almost always involv­ing chick­en, veg­eta­bles, and spices, and often beef and/​or pork. It is cooked in pur­pose-built, steel “booy­ah ket­tles,” which can hold 50 gal­lons or more. Booy­ahs are often held as fund-rais­ers for church­es, schools, fire depart­ments, or VFWs. Lester’s account includes a plau­si­ble expla­na­tion for the odd name. His father was Flem­ish and the stew he pre­pared for the first booy­ah was a tra­di­tion­al Bel­gian recipe. When Andrew went to the local news­pa­per to gar­ner pub­lic­i­ty for his planned fund-rais­er, the young reporter on duty asked him what he would be serv­ing. “Boul­lion,” Andrew replied, pro­nounc­ing it in the prop­er French man­ner. The kid reporter wrote down what he heard and the booy­ah was born. A slight­ly dif­fer­ent ori­gin sto­ry, with a sim­i­lar cast of char­ac­ters, is told on the UW Green Bay web­site. The Pio­neer Press annu­al­ly runs a list of upcom­ing pub­lic booy­ahs around the Twin Cities. Here is 2015’s list; booy­ah sea­son is near­ly at an end. The booy­ah we are attend­ing isn’t pub­lic, and isn’t on the fore­go­ing list. A neigh­bor we don’t know yet slipped an invi­ta­tion into our front vestibule a cou­ple of weeks back (I have anonymized it for our hosts’ pri­va­cy). I assume that they invit­ed folks from a few blocks around. If you had told me a few months ago that I would be going to a booy­ah, I would have stared at you blankly. The word doesn't sig­ni­fy any­thing to this East­ern­er. How­ev­er, the local peo­ple to whom we have men­tioned our plans all just nod­ded as if attend­ing a booy­ah in the fall were the most nat­ur­al thing in the world. Sounds like per­fect food for a fall gath­er­ing! That it does! Con­grats, Ellen, you get First Post hon­ors. Sounds like a fun event. I love fall fes­ti­vals with good food. Tomor­row we are going to the “Shalom Ya’ll” Jew­ish Food Fes­ti­val. Today we had Latin food from a great food truck at an Arts Fes­ti­val. When the weath­er gets real­ly cold up there please plan a trip to come see us. We're all set­tled in and the guest room is real­ly nice for vis­i­tors! Hi Gaye, and thanks — we’ll be on a plane to Savan­nah this win­ter, you betcha! To be hon­est with you, I had nev­er heard of a Booya either, until I start­ed work­ing for the city of Roseville. The fire depart­ment hosts an annu­al fundrais­er each year. I grew up in Min­neso­ta and have lived here most of my life. Did you go, and was it any good? Hi Julie, yes we went. It was a fine par­ty and we met some more of the neigh­bors. The booy­ah was very good. This one was cooked for “only” 12 hours — the hosts got up at 4:30 in the morn­ing to get it start­ed. Some I read about sim­mer for two days. Huh. For what it's worth, I both grew up in the Mid­west (Indi­ana) and live in Min­neso­ta (since 1998) — and today's the first time I've ever heard of this. Hel­lo Dave, wel­come to the par­ty. Find­ing out the oth­er stuff going on out there and let­ting the world know about it is the job of this blog! I’m not sur­prised that an Indi­ana upbring­ing wouldn't have acquaint­ed you with the booy­ah. The sources I read said its geo­graph­i­cal extent is north­ern and north­west­ern Wis­con­sin, around the Twin Cities, and Michigan’s Upper Penin­su­la. I grew up with bouyas, my uncle would come from Seat­tle and stay up all night mak­ing bouya in huge black ket­tle, stirred with a wood­en pad­dle, with beef, chick­en and all kinds of veg­eta­bles. It was a fun way to have a fam­i­ly gath­er­ing. It's deli­cious. I have made it myself. Hi Lau­reen. Inter­est­ing, did your fam­i­ly spell it that way, or where did you encounter that spelling? 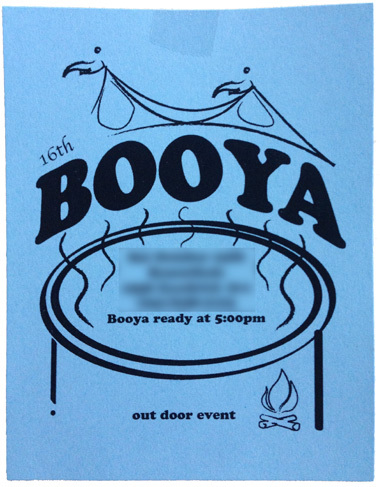 I don't see many ref­er­ences online to “bouya”; “bou­ja” is more com­mon, but “booya[h]” rules the roost.